I was asked recently by barb, from the Melbourne Silver Mine to answer a few questions. The answers are now posted on their blog, check it out, thanks again to barb and the Melbourne Silver Mine for the opportunity. Thanks to Nettsu a contact on twitter, I was pointed to this article about the benefits of film. It is a good read and given my own background in film photography, made plenty of sense. Way back in 2003 I wrote an article on the issue of film versus digital. Back then cameras, where prohibitively expensive, and digital storage was far more expensive than it is today. Photoshop of course, was the, mostly widely used application used to open and edit photographs on a computer, in some cases the only application. RAW files were yet to be part of the mainstream. Raw files and new applications for sorting and editing photographs aside things haven't changed that much. Making a good image still requires a modicum of understanding about, lenses, light, at the minimum, making a print either digitally or via analogue requires it's own skill set, making a body of work, requires another skill-set, that has no bearing on technique or the ability to understand how your camera works. Making prints and using cameras are skills with a plethora of manuals [10,723 Results on Amazon today alone] available to anyone with enough interest in the medium to buy a handful of books and get access to the machinery to do this. Creating a body of work can often be done in isolation, or done in a more formal manner through training in a fine art degree program. Learning to 'pre-visualise in photography can be both learnt and taught, but is I feel the most difficult part of the process to really master. Many of the points alluded to in the article above by Ken Rockwell, assume you have mastered the craft of photography, something that can be quite expensive to learn as a beginner in photography, and this is where digital shines over film, I feel. Making mistakes is the quickest and easiest way to learn the basics of exposure and composition. Making mistakes with film, on the other hand can cost a lot of time and wasted effort, if you haven't already mastered your camera craft. Finally the biggest issue I had with Mr Rockwell's article, was he seemed to sometimes refer to colour neg and other times colour slide, or positive film, two films with vastly different exposure latitudes, and some of his points were invalid if you used negative film as reading a colour neg over a light box, requires considerably more skill and knowledge than a slide film, which is simply a positive of the scene as taken. So, here's a new table of the pros and cons of digital over film, based on my own experience of teaching camera craft, and using a variety of film cameras since the early 1980's, and digital cameras since the mid to late 1990's. I do however agree that digitial has it's place in industries like catalogue photography fashion, and photo-journalism. Speed. May mean practicioners, will shooot 'by the pound' and add to a future worload of sorting. Limitless copying. Manipulation Applications don't allow an under the hood approach to most users, compared to film developer and paper developers. Instant feedback. Can be distracting as it will draw your attention away from what is going on around you, meaning less possible opportunities, photographically. Storage space for images/files. Ease of deletion could mean a loss of cultural history, or just an overwhelming amount of bad photographs, anecdotally 3,000 images a minute are uploaded to flickr alone. Only requires a desk and electricity, no special room. Storage types and Mediums change making large archives difficult to manage, you must have electricity. Camera Prices drop exceptionally every two years or so. Hardware and software requirements may mean constant upgrades. Location shooting requires hardware to process, archive and sort. Adding considerably overall weight of a camera/travel bag, and to time and cost involved in 'editing', batteries must allways be charged and ready, spare batteries for cameras a must, if you are a prolific shooter. Raw files allow more exposure options, thereby enabling richer fuller print. Raw formats at the date of writing are a moving target, some software, photoshop for example needs to be kept up to date to open and process these files, from recent cameras. Processes can tinkered under the hood easily, long history of published texts Storage of film and prints requires physical space. No loss if treated with the right approach to entire process Losse are uneditibale if too extreme. Film has better exposure latitude than CCD especially negative films Calibration maybe required to really understand what is going on. Older film Cameras, were made to last many years, many require no batteries thereby lowering the load of the photographer 'on location' Film needs to be stored correctly and may one day cease to be made. This just in in my inbox. PolaPremium is more than delighted and proud to announce the opening of the very first pure PolaPemium Shop in Berlin. This is our first step into the challenge of presenting our beloved analogue products not only online at PolaPremium.com, but offline as well. On our continuing mission to celebrate the magic of instant photography, we take our first baby-steps to develop and build a worldwide network of selected authorised PolaPremium partners. The new shop in Berlin is the shining starting point of our offline adventures and based on the experiences we collected and will collect there, we will soon start to search for more retailers and partners all over the world. So please stay tuned. Things are looking up for Polaroid products, eh. Found this today on youtube, one of my favourite Sci-fi movies on DVD, again. Here's a Downloadable pdf of the processing matrix, that may be easier to read. I shot the first half of the DOF exercise on Friday. I used a zoom and a fixed lens. Just looking at the lens markings on the zoom confirm yesterday's post. The second half requires either a portrait or a still life. The reason we use either a portrait or still life is, because when the subject is closer than 8 times the focal length of the lens the relationship of f/g and b/g DOF changes. 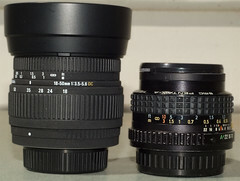 Here are the two lenses used, it's interesting to notice that, the Zoom lens made for the Digital camera, has a smaller spread of distances under 1 metre than the fixed lens. Yesterday at work, we were discussing an exercise the students undertake to understand Depth Of Field. Historically, we get them to take 1 shot at 3 different apertures in one location on a tripod then shift focus and repeat, finally focusing on infinty and repeating again, as well as a portrait at 3 different apertures, on a tripod. A year or so ago I did this exercise using a Canon 350d, and the differences were NOT as apparent, as a traditional 35mm camera, I left it at that and haven't given it much thought since. When I mentioned this in the meeting a passionate discussion then ensued as to why this was the case as we are contemplating getting the students to do this assignment using digital cameras. Beginning students need to see big differences quickly and the 350d wasn't giving the results I'd expected. As a result, we found the answer. It has to do with surface area of the light capturing surface and size of circle of confusion. The smaller the film/sensor area the more D.O.F you have. Let's let Bob Atkins explain it. "So the bottom line - and all you really need to know - is that DOF is inversely proportional to format size. Note that format size is inversely proportional to the "digital multiplier". The higher the "digital multiplier", the smaller the format and thus the greater the depth of field. Note also that now you can see one of the reasons large format camera users need tilts and swings to get adequate depth of field. With an 8x10 camera you have about 8.5 times LESS depth of field than you do with 35mm for the same image. This also explains why consumer digicams, some of which have sensors 1/6 the size of 35mm film, have such a large depth of field and one of the reasons why it's almost impossible to get blurred backgrounds when using them." The difficulty for us to teach the principles of D.O.F is that all cameras have different sized sensors and only cameras like the $4,000.00 Canon have 35 x 26 mm sensors. A camera few students can afford and the type that is not held in stock by us because of their delicateness. Today I am going to shoot the exercise on the Pentax k100d, which has a larger CCD than the Canon 350d. I may post the results over at flickr, we'll see? Want to keep on shooting with it?